The nascent Muslim Community of Grenada has been able to lay down a foundation for the future generations to be able to have the infrastructure to sustain the practice of faith as well as to experience the bond of community. Over the past four decades the community has had many obstacles and challenges to overcome. Despite its small scale it has been able to maintain its existence with a bit of help from the larger Muslim Community of Trinidad. Here Azam Rahaman, who has been a part of this battle of endurance, reviews the recent history of Grenadian Muslims to sustain faith and community. The 1970 Black Power movement in Trinidad gave rise to a number of young Grenadians accepting Islam under the leadership of a strong advocate named Muhammad Yusuf (May ALLAH be pleased with him). He had a remarkable following by a dynamic group of young men and women whose religious devotion left a very vivid impression on the minds of a large segment of Grenadian society, many of whom were graduates of prestigious institutions as the Grenada Boys’ Secondary School (GBSS). Their mode of dress was akin to middle eastern style Islamic apparel, the men in topees, long jubbas and sheppard’s staff and the sisters in flowing, loose-fitting chaddor with their heads properly covered. They could be seen walking in groups in the main towns and villages engaged in Dawah activities. 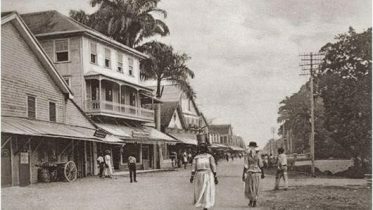 Their recognition grew to the extent that in the early seventies they were allocated business premises on the ground floor of what was known as the former Town Hall building situated in the Market Square of the capital, the Town of St. George. They excelled in leather craft, making by hand – shoes, sandals, handbags etc with limited hand tools. The men were affectionately called “ Ahkee” (brother in Arabic) by many who regularly came into contact with them. During the early period of the 70’s there was no structure from which Muslim activities could be carried out. Jumuah salaat (Friday congregational prayer) would be conducted at the home of Brother Abdul Rahim (May ALLAH be pleased with him) at Tempe in St. George’s. Simultaneously, the Ismail Party (IP) was introduced into Grenada with its Jumu’ah prayer carried on in Beaulieu, St. George’s. At some point also the Trinidad headquarted, Islamic Missionaries Guild of the Caribbean and South America (IMG), was instrumental in renting the family house of Br. Muhammad Siddiqui at Fontenoy as well as provided an Imam to deliver the Khutbah (Friday pray sermon) . In 1977 Sheik Fuzloo Rahaman of San Fernando, Trinidad, (son of Hafiz Yacoob Ali) (May ALLAH be pleased with them both) instructed his sons (who were entrepreneurs in Grenada) to allocate one-half of the top floor of the Bobby’s Tyre Mart building on Tyrrel Street over the fire station. This location became known as the “Islamic Centre” . A large sign with the name Islamic Centre was proudly displayed with visibility from the Carenage and throughout the surrounding hills. This facility was utilized for Jumuah salaah, nightly Tarawih namaaz (prayer during Ramadan) and all other faith rituals and community purposes for the next eighteen (18) years. In 1982 a candle lit meeting (a blackout night in when electrical ’load shedding’ was the norm), was held amongst five brothers who were determined to establish what is today known as the Grenada Islamic Foundation (GIF). The GIF was founded by an Act of the Grenada Parliament # 44 of 1994 and was proposed in Parliament on behalf of the Muslims of Grenada by the then Honourable Member of Parliament, Dr. Francis Alexis. In the 80’s the Muslim Students Association (MSA) was founded at the St. George’s University School of Medicine under the aegis of Br. M. K. Hosein . Br. M.K. was a Director of the IMG and a stalwart Dawah strategist whose work within the Caribbean region was quite substantial and requires documentation. It is worthy of note that the name Grenada Islamic Foundation was proposed by Brother Omaar Al-Shareef. The growth of the Muslim community required larger premises therefore a legal agreement was drafted to occupy and purchase the Panache building at L’Anse Aux Epines in the developing south of the island. Due to insufficient funds to complete the transaction, the acquisition of the property was not realized after having the use of it for approximately three glorious years. During this period the Al Shifa Free Medical Clinic was established to serve all the people of Grenada and it was successfully managed by Dr. Ateef Qureshi. Now confronted with the stark reality of that loss and no place to go to, the Shura consented to approach the Ministry of Sports for the rental of space for Jumu’ah salaat which would be held at the Youth Centre in Grand Anse for the next two years, thereabout. 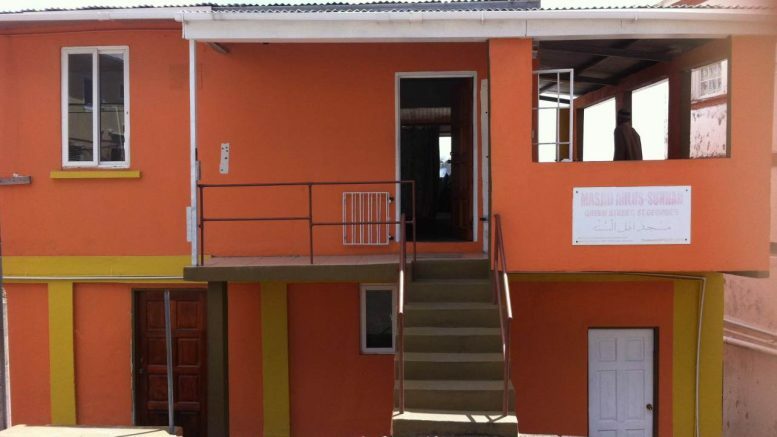 It was in 1999 that an eight thousand square feet parcel of land located close to the island’s Point Saline International Airport was donated at Calliste in South St. George on which the GIF built the first Masjid to be constructed in Grenada. The passage of Hurricane Ivan left a heavy toll of destruction on the southern part of Grenada in September of 2004. The roof of the Masjid was severely damaged and the houses of many Muslim families were either demolished or partially damaged. With assistance from the Muslims of Trinidad, Barbados and the Islamic Development Bank in Jeddah, SA, the GIF was able to provide foodstuff, some clothing and shelter to many Muslim families and to our non-Muslim neighbours in part. The Foundation had constructed seven (7) houses and had repaired or assisted in the repair of many more. In is noteworthy that before any of the churches or government agencies were able to mobilize food and essential items, the Muslims were the first to bring aid in the form of food and building material to the doorsteps of the non-Muslims in the deep south of Grenada. Alhamdulillah (All Praise is due to God), the Muslim population in Grenada has grown to three hundred persons with mixed African and East Indian ethnicities. Since the completion of Masjid-Ul-Madina ten (10) years ago, the community has settled comfortably and enjoys a remarkable level of stability and sustainability . It is endowed with two Huffaaz of Qur’an and a graduate from the Dar-ul-Uloom Institute in Central Trinidad. Madressa classes are held every Monday to Friday from 4 – 7 PM with the number of students at thirty-five (35). Two of its graduate students have gone on for further Islamic studies in South Africa. Hafiz Yunus Karolia is our Imam and also the Principal of the Madressa. We ask our kind readers to remember our community in your duas, that our Jamaah may succeed in disseminating the message of truth in Islam by way of Al Qur’an and As Sunnah as exemplified by the messenger of ALLAH, Muhammad (SAAS). Be the first to comment on "Grenada:Struggles of community formation and sustainability"
– 15 years after slavery was abolished This is an extremely important book as it gives a snapshot of British Guiana almost 160 years ago……. PM Kamla – Islamic principles and teachings form part of our national identity.